You are here: Home / Gold / Your Gold investment can be actually a Dead Asset; Here’s Why? Your Gold investment can be actually a Dead Asset; Here’s Why? Somehow the trust and madness over Gold never dies down. 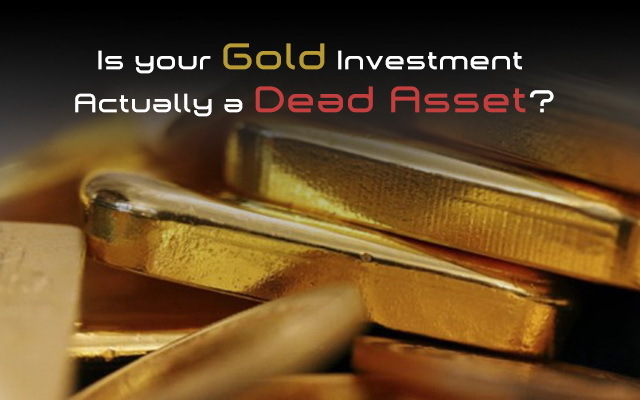 However, it can be a bad investment and can actually result in Gold being a Dead Asset to ‘invest’ in and in this post we shall see why is Gold a Dead Asset. On reading the post title a lot of you may feel I am out of mind or I have no clue of what ‘investment’, ‘savings’ and ‘finance’ mean and am just writing for the sake of it. But trust me it’s not the case. I know exactly what I am talking about and I repeat Gold is a dead asset. An asset that will not be of any help to you to earn money or get returns on investment from time to time is a waste of investment money and is therefore a bad investment. Still thinking? Let’s understand Why is Gold a Dead Asset? First things first, this is India; and in India Gold is Gold and it will glitter and it will melt our hearts and pull us towards it to put in our money as investment and give the illusion of asset building. But then a lot of us miss the point of ‘investment‘ and asset building. Investment is something that will give you returns at a certain point of time, from time to time. In other words, it should not be something that will just sit in your portfolio for eternity waiting for its one chance to be used and prove worthy. Now put this in perspective with GOLD. We buy gold and think it is the best investment and you are not a true Indian if you do not invest in GOLD. But do we sell it unless it is an emergency or some wedding or ceremony? No. So how can Gold give you return if it is not sold? We only buy Gold and that too a lot of us buy jewelry. Gold jewelry is not an investment and has additional costs like making charges to it. Gold can be a good investment class only if it gives you returns on your investment that you can actually use. If the value of Gold goes from 25,000 INR per gram to 31,000 INR and you feel you made a profit of Rs. 6,000 per gram of your Gold investment, you can say so only if you actually plan to sell your gold to get that money to use it elsewhere or for further investment. That is actual returns on investment. But usually what happens is Gold lies in the locker and its price increases on paper, but what returns we get? Your locker is not an ATM that will convert your Gold into cash that you can withdraw. You will have to get it out of the locker and sell it to get the returns. And we DO NOT DO THAT. Do we? We don’t, we never sell Gold. Why? Because it is a sign of ‘rough times’ or people think we have some financial problems. The other major reason is that a lot of this Gold is in the form of Gold Jewelry that has sentiments attached to it. Hence it all results in Gold being a Dead Asset. At times Gold and Gold Jewelry is passed on to generations and generations without being utilized monetarily, because it is a symbol of your heritage. Fair enough. But again such type of Gold is not an asset or investment because you will never look to monetize it. You might argue here that people do not sell Gold because it is a long term investment. Agreed. But even equity is long term investment, but it gives you returns even before you sell it. It will give you returns in the form of dividend that you can either use, or re-invest. There are even bonus shares issued by the company at some point. Same thing can be argued for property. But again property has a potential to give you at least some sort of rental income. Thus even these long term asset classes give you some sort of returns, which you can use from time to time. Gold does not give such returns. You will have to sell Gold to get anything in return and this is where we Indians loose out. We are sentimental about Gold, we have bought Gold today for our child’s wedding or saved for emergencies or we have kept it because it is a gift by some loved ones. Fair enough. Gold is a good thing to put your money in. But do not treat is as an investment, if you will never ever gather the courage to liquidate it. Today our economy is stuttering and faltering and while a lot of us may blame it on corruption, speculation, foreign economies, external factors, Government reforms etc; a fact that this very habit of ours to keep Gold in the lockers and block it for years together has also contributed to this. Gold prices have shot up due to the imbalance of demand and supply. Lot of people are buying it in all forms, but not many are selling it. This is resulting in speculation, lack of supply and ultimately the Government stepping in to curb the sale and imports of Gold to bring some sense in the economy. Investment in Gold can only be called an investment if it is regularly traded for returns. But this is not seen so often especially among the common man because psychologically any asset that has high appreciation value is difficult to sell. People always think this is not the right time to sell; price will go up and stick to it or simply keep it stashed away. The other fact that Gold is actually not an asset per-se is that even if you were to keep the Gold bars and Gold coins to use it later at a family wedding to make ornaments as Gold prices will be higher in the future, your 10 gram of Gold today may not be translated into a 10 gram of ornament in the future. This is because there is loss of Gold due to cutting, melting, fixing designs on it etc. Its purity too will take a beating in the process. Also you will have to pay making charges. Agreed, still it will be cheaper for you if you go to buy Gold at that time in future, but still it is not an Investment as such. Now if you argue that Gold lying around has the capability generating funds when you need them even without selling them through Gold Loans, then again you are wrong. Yes Gold can be used for generating money even without selling it by pledging it for Gold Loans, but this is not an Asset. In such a case while Gold is generating money for your needs even without selling it, it is actually creating a Liability for you in the form of Loan. Loan is a debt and you will have to re-pay it with interest. In this case Gold is an asset, but for the company giving Gold Loan as it is generating income for them and an outflow for you. This is the very reason there is a spurt in Gold Loan providers from banks to private operators, all are more than happy to provide Gold Loans. 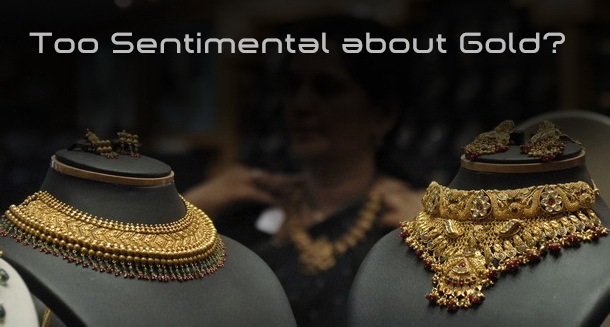 They know Indians have gold that will never be sold, and the best way to earn is to provide loans and earn interest. The other fact is the chances of default are less as we will do anything to get back our family necklace or that ring your grand-ma gave you, from the lender and repay the loan. Having said all that, Gold is still a good Investment class if and only if, it is regularly monetized for returns and not just stashed up. If you want to keep gold as an investment for the future for uses such as marriages, functions, etc where you will make them into Gold Jewelry, then it is better to buy Jewelry itself today either in lump sum or through various gold savings schemes if you are concerned about the design being out-dated and you can refer here and here for a better understanding of it. However if your sole purpose is Investment, opt for Gold Bars, Gold Coins or better still go for Gold ETF, e-Gold etc. Have a look here at the various options to invest in gold. But remember; keep monetizing that gold to actually get returns on investment or else it will make you feel that Gold is a dead Asset. Correct. its surely a dead investment. Sir, suppose I have a house of my home, yet I buy a land for investment purpose. But I don’t use that land at all. I don’t even rent it. It’s just kept vacant. Is that also known as dead investment. And is this the reason for the hike in land prices. Dead investment is something that even though you are willing to liquidate you are not able to do so. By that I mean like you home, since you live in it, you will think twice before selling it, and even if you do, you will have to buy a new one from that money you earned from it. So technically you don’t earn much as investment from it. In case of land, it can be dead investment in two cases: 1. You are not able to sell it or don’t want to sell it at all and make money from its selling, or make a profit out of its sale. OR 2. The land doesn’t appreciate in value at all and you potentially can’t earn anything extra out of it. If you are willing to selling after some years and the value appreciates, then is NOT a dead investment. Hope it clears the doubt. I think the whole culture, system has changed so drastically. Once upon a time our grandfathers, fore father’s We’re our money managers. And with changing times improper knowledge we have now handed over our money to so called fund managers, who claim to know more about our family than we do. Aniket I suggest you also have this written and sorted out for general public. Agreed……people these days make these mistakes of investing blindly following tips and never looking back at their investments…and while fund managers do help there shouldn’t be ignorance about one’s own money and blind faith in anyone. I think it is a good topic you suggested Jay. Thank you will work something on it soon. Super information, this is an eye openere we all know these facts but still follow tthem blindly. Verry well explainted aniket thank you. Good to know the content is relevant and appreciated, Keep coming back for more. Thank you. What was the value of gold in 1976. And what is it today. I am sure you have a year to year average rate chart for gold till date. I believe Any investment that does not give you returns and in which u have to incure maintenance or other charges is just a liability. Even a house. Its not an asset but merely a need. Pls help me sort out my query. Thank you for your interest in the post. And good point you made. The article says exactly that, there is no denying the fact that gold is an appreciating asset class, but the point is how we treat the asset class. Gold can be a good investment if we ever plan to use it to get returns. But we rarely do it. And that is the point if one feels that merely buying some gold and thinking it as an investment is a misconception. Also the same applies for a house. If you are using it for personal use it is not actually an asset untill you decide to move out and sell it. Surely then it will be an asset but do not consider it untill you actually monetize it, however house still has a value of keeping a roof over one’s head. That was the whole point of the post…..monetizing or returns.